Charge your PUSH Band by flipping open the rubber door at the bottom of the unit. Plug in the Micro USB adapter and connect to a laptop or usb-to-wall connector. Pro Tip: Charge your PUSH Band for 6 hours when you first receive your PUSH Band. Making sure your PUSH Band is charged, press and hold down the top button on the PUSH Band to turn your PUSH Band on. 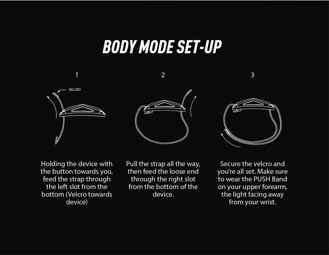 The PUSH Band will start flashing blue as it looks for an iOS device to connect to via Bluetooth. To turn your PUSH Band off, hold down the same button on top of the PUSH Band until the light turns off. 1. Make sure your Band is ON and flashing blue. 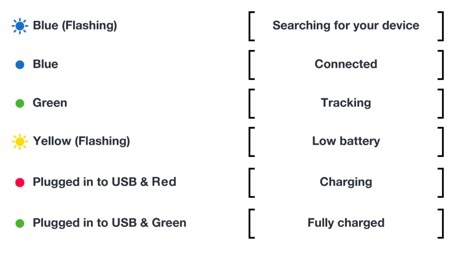 Note that the band can only be connected to 1 device at a time so if the Band is Solid Blue, it means it's connected to another iOS device already. 2. Launch the PUSH App and click on the menu at the top left. 3. The PUSH Band image at the bottom of the menu is where you pair and choose mode (Bar mode or Body mode). Click on the icon and follow the simple prompts. Having Trouble Connecting Your Band? 6. How Should I Wear My PUSH Band? When using the PUSH Band in BodyMode our algorithms require the light to be pointing upwards, towards the top of your body (e.g. towards your elbow if using the arm sleeve, or towards your head if you are jumping). 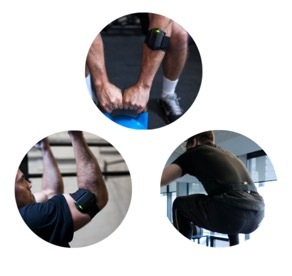 The PUSH Band can be worn on either arm. For the vast majority of exercises, you should wear the PUSH Band on the top of the forearm, just below the elbow. The strap should be tight, but comfortable! Your PUSH VBT Mobile App will display the proper Band placement for each exercise. 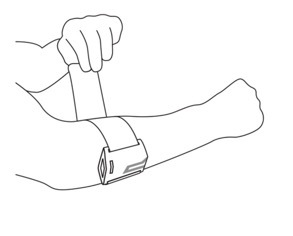 For the majority of exercises place the PUSH Band on the upper forearm, with the light facing away from the hand. For jumps in Test Mode and Free Movement, place the PUSH Band firmly on your athlete's lower back just above the tailbone. To do this use the PUSH Jump Waist Belt, and ensure that the light is facing upwards towards the head for optimal data collection and accuracy. For bodyweight and some resistance exercises, the PUSH Band is worn on the lower biceps. Please ensure that the unit is worn so that the light faces away from the hand. 7. What Do The Different Light Colours On My PUSH Band Mean? 8. What Does the PUSH Band Track? • Power - The rate at which work is performed (Force x Velocity). • Work - The magnitude of force causing the movement of an object over a given distance. Can also be used to provide energy expenditure. 9. Which Exercises Does the PUSH Band Track? To get the most out of your training, we have created a database of exercises that our PUSH Band will help you track automatically. For exercises that we don't automatically track, you can manually log the number of reps you performed. We are continuously adding more exercises to our database. Scroll below to submit your suggestions for exercises to auto-track next! Our three most popular are highlighted at the top of the Training Screen. To select any of these three, simply click on them and they will turn blue. If you want to select a different exercise, click the 'More Exercises' button to access our full list of 400+ exercises. In the 'More Exercises' screen you can scroll through the list of exercises and select your choice by clicking on it. Additionally, you can search for exercises in the top search bar, filter the exercises with the filter icons (top row), or highlight your favorite exercises using the star icon allowing for quick searching the next time you would like to find them. Pro Tip: Search for RT to see all the exercises that utilize PUSH’s Real Time capabilities. You can also filter by equipment, and change your training focus from this screen. Click on the load value in the selected exercise box to access the load input calculator. Enter your desired load and toggle easily between pounds and kilograms. Directly above the exercise selection boxes you will see a field marked ‘None’. Click here to access the VLC menu, where you can prescribe relative/absolute VBT parameters, or use one of pre-defined ranges depending on the physical quality you are looking to target. You're ready to start! Click your PUSH Band button or the ‘Ready’ button on your VBT Mobile App display to begin your set. 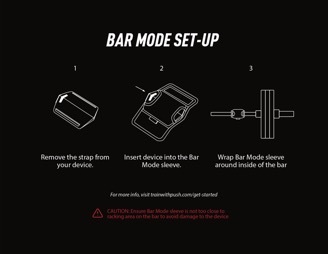 Click your PUSH Band button or the ‘End Set’ button on your VBT Mobile App display to end your set.